LONG BEACH, California (April 15, 2010) – Racing and stunt driver Tanner Foust will take on a packed field of high-profile competitors this weekend during the Pro/Celebrity race, part of the 36th annual Toyota Grand Prix of Long Beach. A field of 18 drivers in the charity contest includes a host of media and entertainment personalities, actor and defending celebrity champion Keanu Reeves, skateboard pro Tony Hawk and radio personality Adam Corolla among them. Racers including 1996 CART Champion Jimmy Vasser, IMSA GT Champion and STILLEN founder Steve Millen will join Foust in the pro category. Drivers will get behind the wheel of identically prepared, race-ready Scion tCs in what has become the world’s longest-running, most prestigious celebrity racing event. The pros will give the celebrities a 30-second head-start and it’s expected the on-track action will be fierce. The 10-lap race on Saturday (April 17) follows a 1.97-mile street circuit through the downtown streets of Long Beach in Southern California, and is one of six featured events during the weekend. children’s hospitals in Long Beach and Orange County, Calif. On behalf of the race and its participants, Toyota has donated more than $1.8 million to various children’s hospitals since 1991. A $15,000 donation is also made in conjunction with the 13th annual People Pole Award. Sponsored by People magazine, the award honors the pole-position winner of the Toyota Pro/Celebrity Race qualifying session on Friday, April 16. 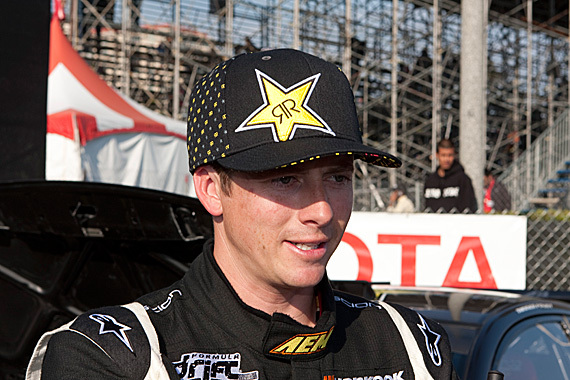 The event follows Foust’s 2010 debut in the Formula Drift championship. The two-time champion achieved a podium finish in his Rockstar Energy Scion tC, finishing the event in third-place overall. In addition to running a full Formula Drift season, Rockstar Energy driver Foust’s 2010 competition schedule will also include a packed schedule of European Rallycross events, ESPN’s Summer X Games and select rally events. His next competition is the Portugal stop on the European Rallycross tour, May 1-2.